Browse: Home » Unity Award 2013 – Nominated! Unity Award 2013 – Nominated! 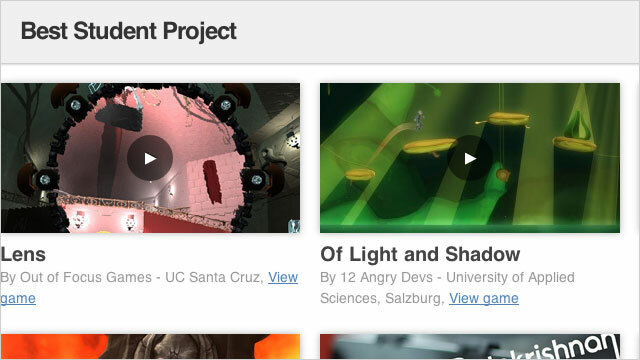 I’m very proud to announce that Of Light & Shadow has been nominated as finalist for the Unity Award 2013 in the category Best Student Project! Wish us luck! Unity Award finalists display some of the best and brightest professional and amateur talent within the video game industry across platforms from iOS and Facebook to PlayStation 3 and PC. 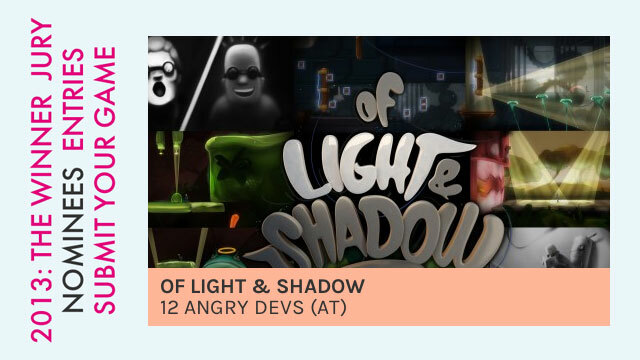 Since I forgot to mention it here, Of Light & Shadow was nominated alongside Dear Esther, The Bridge and other great games for the 2nd A MAZE. Indie Games Award in April 2013! 2nd International Indie Games Festival in Berlin – From April 24 to 26 A MAZE. Indie Connect brings together international indie game developers, creatives and enthusiast in Berlin. You can expect two days of inspiration, skill, celebration and play. Talks and workshops give you insights and help your craft evolve, while exhibitions and game showcases give plenty of opportunity to play and enjoy your favorite art form. The Urban Spree is a fertile ground for face time. So bring your game. A MAZE. is also proud to award the 2. A MAZE. Indie Games Award for The Most Amazing Indie Game 2013. Finally, the event finishes strong with a electronic beat driven closing party, to keep the indie community moving till dawn. A MAZE. Indie Connect is part of the framework “DGT 13 – Deutsche Gamestage” and in cooperation with Quo Vadis Game Developer Conference in Berlin.